Free trade agreements (FTAs) provide companies more prospects to expand their businesses into key overseas markets and gain competitive edge to improve profitability. Currently, Singapore has a network of 23 bilateral and regional FTAs with 34 trading partners. Therefore, companies that operate in Singapore are strategically positioned and stand to benefit greatly from utilizing these FTAs. 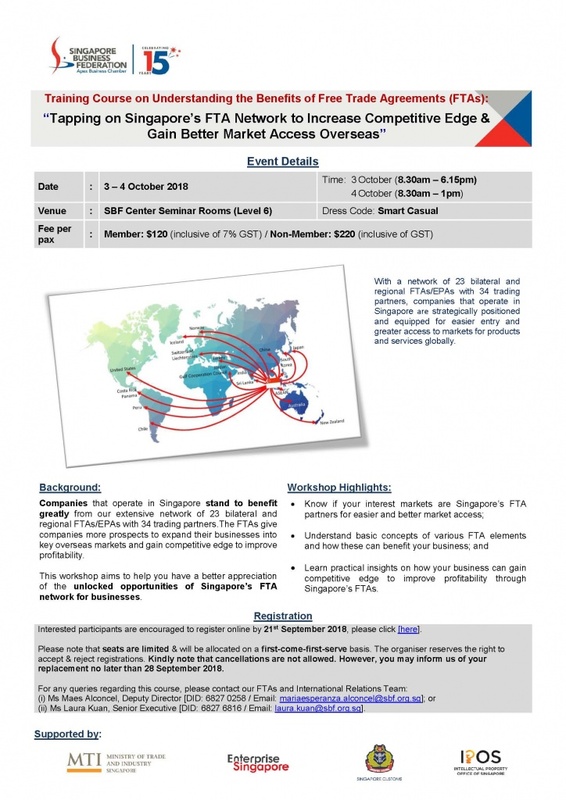 This workshop, which is a second run of our FTA flagship course that was launched in April 2018, aims to help you have a better appreciation of the unlocked opportunities of Singapore’s FTA network for businesses. You will learn basic concepts of various FTA elements and how these can benefit your business directly from Singapore’s trade policymakers and negotiators; as well as practical insights on how your business can gain competitive edge to improve profitability through Singapore’s FTA network from experienced supply chain management/FTA experts and Singapore companies. To attend the aforesaid event, please register online (click here) by 21 September 2018, 6pm by logging in with your username and password . If your company is not an SBF member, kindly create an account for registration. Please note that seats are limited & will be allocated on a first-come-first-serve basis. The organiser reserves the right to accept & reject registrations. In addition, kindly note that cancellations are not allowed. However, you may inform us of your replacement no later than 28 September 2018. (ii) Ms Laura Kuan, Senior Executive [DID: 6827 6816 / Email: laura.kuan@sbf.org.sg ].